You won’t see another elliptical machine that looks like the Ironman CDT elliptical trainer. This innovative piece of machinery is being advertised by Keys Fitness (makers of the Ironman series) as the next great leap in elliptical technology. 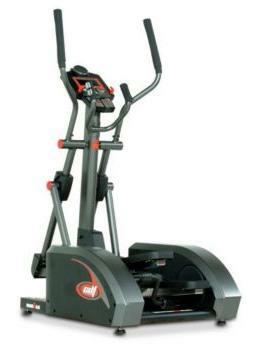 At the top of the Ironman line-up, the CDT is really an exceptional elliptical trainer even at about $1,700. It still comes in below the mark of some comparable ones that go at or over $2,000, and you can rely on the stability of this thing to wear like iron. Fitness trainers are a hard sell on anything that’s as innovative as the center drive system. In general, they prefer the feel of a rear flywheel’s elliptical pattern. Several of them, however, have commented that the feel of the Ironman CDT is comparable to that of a rear flywheel elliptical trainer, and some admit that the posture is more natural, with less bending forward, with this design. The scores by consumers who have reviewed the Ironman CDT elliptical trainer run right around 4 to 4.5 stars out of 5. Need we say more? They’ve put the whole package together in the Ironman CDT. We’ve always liked Ironman for building a nice, hefty machine that can withstand heavy workouts, but we had reservations about the stride length on many of their elliptical trainer. We can quit harping on it now – the 21” inches you get with the Ironman CDT is the best you can get in an elliptical. When they also add extras varying from little (the cooling fan) to truly impressive (we think the Center Drive Technology is really going to catch on in a big way), they’ve achieved great stuff at a very reasonable price. We encourage you to try out the Ironman CDT elliptical trainer – see if you like the Center Drive Technology as much as we’re betting you will.